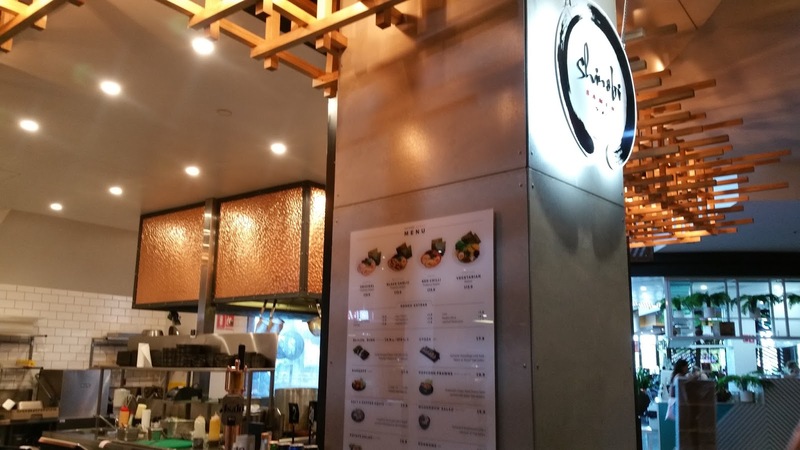 Living in the southside, I hadn't trekked east for quite some time, so when a friend suggested that we do some shopping at Carindale, I was keen to try out Shinobi Ramen, a Japanese Ramen Bar that I've heard quite a bit about, but yet to try. 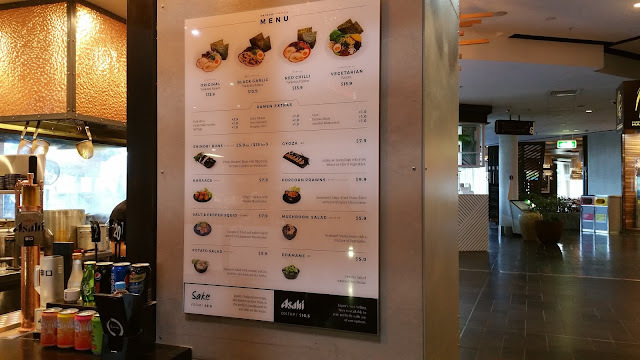 Being situated close to the relatively new and extremely beautiful glasshouse, the store was in the middle of the shopping corridor, which isn't usually what I like (preferring the seclusion of a corner stall), nevertheless, we went to try it out. Rather than a movable menu, the selection was printed on a plastic board on the wall. It was short, with four variations of ramen and eight types of sides, but that was more than enough for us. Ordering at the counter, we grabbed a number and awaited our food. 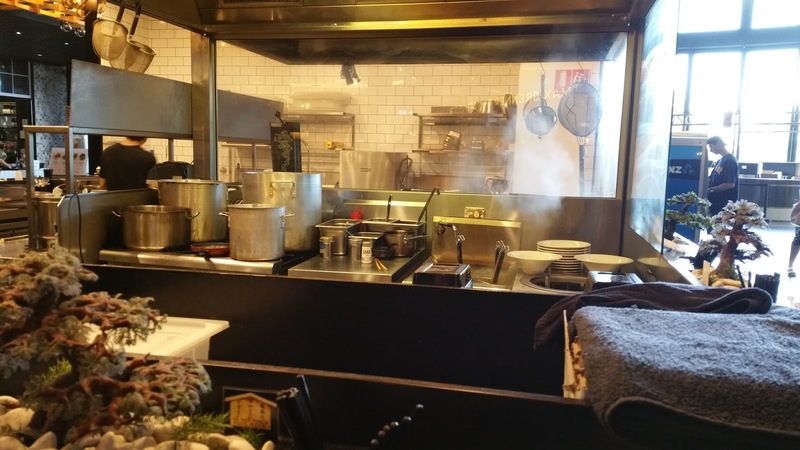 One of the highlights for the store was that the seats were placed all around the perimeter of the store, which gave me a perfect vantage point of the chef in making our lunch. 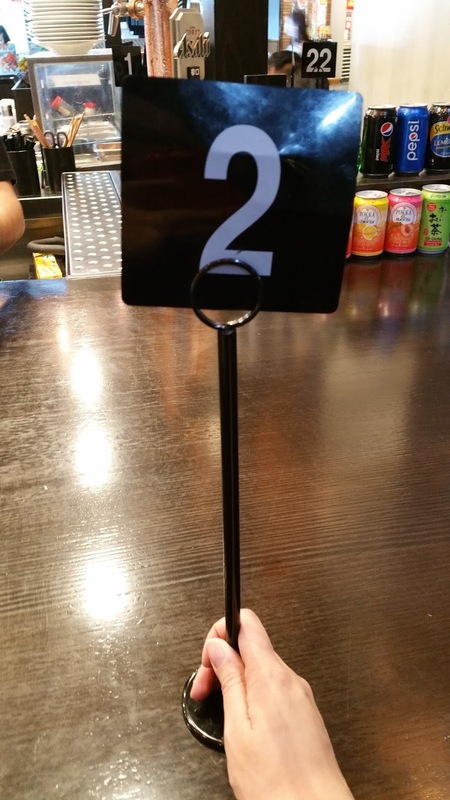 Being one of the earlier customers, there was minimal wait on our food, which arrived very promptly. 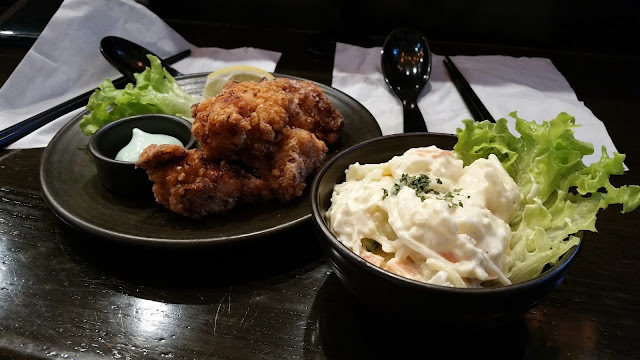 Between the two of us, we shared two sides, the Kaarage Chicken and Potato Salad. Kaarage Chicken was quite tasty, being freshly fried with a crispy skin, albeit a bit on the fatty side, with considerable oil bursting out upon biting into it. 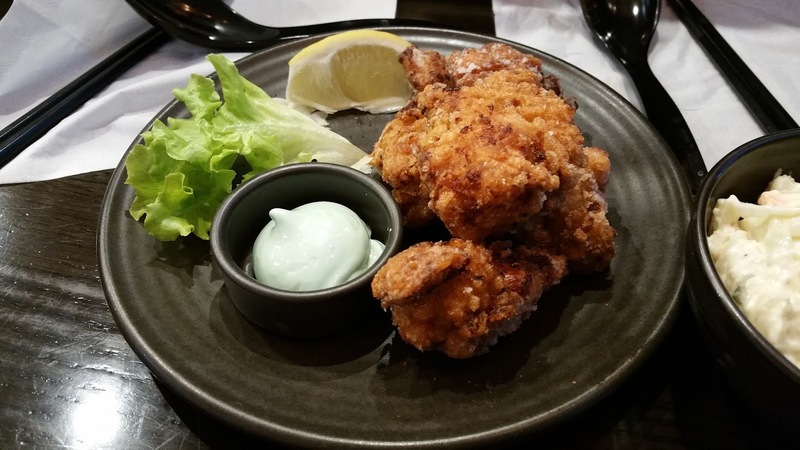 Whilst the side piece of lettuce wasn't really that much, it did help balance the dish a little, on the other hand though, the wasabi mayonnaise was unusually sweet and not very spicy, so we opted to avoid it. To balance out the chicken, we had a serve of potato salad. 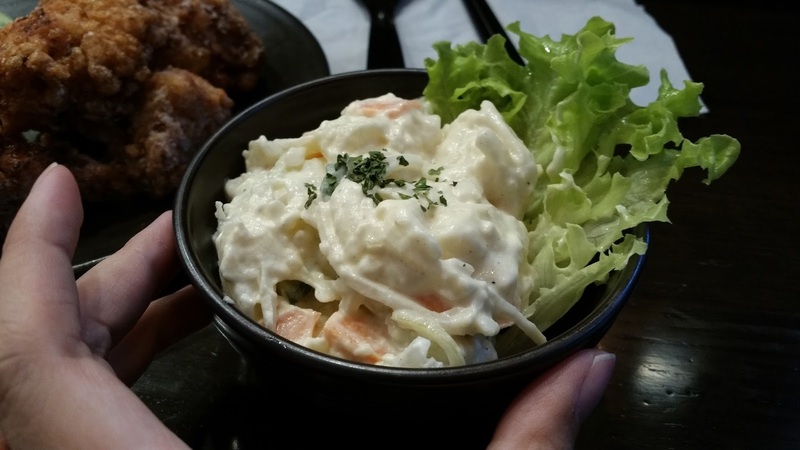 It whilst other potato salads that we've had before looked similar to an ice cream scoop, this was far chunkier, with very easily discernible pieces of potato, onion and carrot in a creamy mayonnaise dressing, which we really enjoyed. 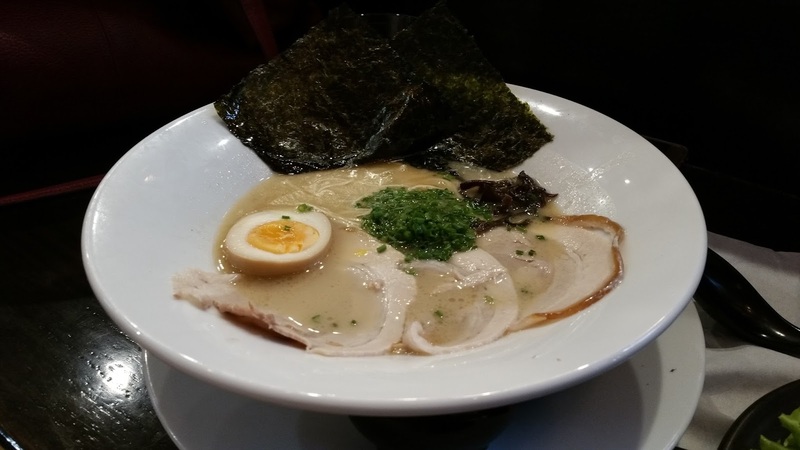 My companion had the Original Tonkotsu Ramen, their signature dish. She found it to be quite good, although the egg was on the overdone side. 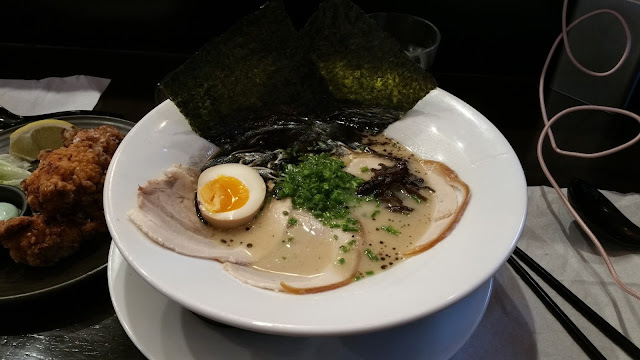 I had the Black Garlic Ramen, which was essentially the same as the original tonkotsu, but with an added dash of black garlic oil. My egg was definitely done better than hers, although it was still cooked quite thoroughly on one side. 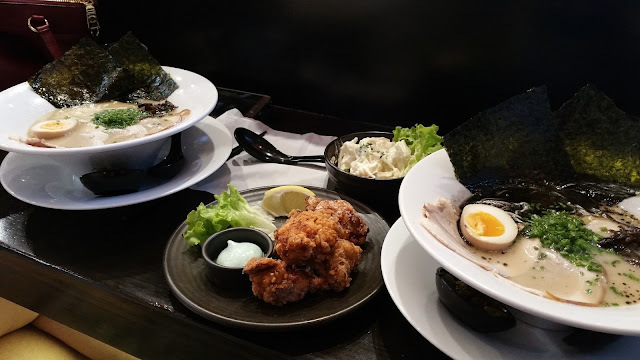 It was served with three pieces of chashu, some shallots, black fungus and two pieces of nori. I really enjoyed the soup that wasn't too rich nor too overbearing, but struck a good balance, although the depth of flavour wasn't as good as Taros. The meat was very tender and melted in my mouth, whilst the shallots and black fungus gave it some added crunch. I did enjoy the black garlic oil, but I feel that the taste could definitely have been stronger.